The People’s Pope shows that he is a down-to-earth man who understands both religion and children. Left-hand pages show 30 actual letters and hand-drawn pictures from children around the world, culled from 259 submitted, along with snapshots of the children, their names, ages, and countries, and the typed English texts of their letters. Right-hand pages, on paper meant to look like Vatican stationery, bear the pope’s answers, given in an interview with editor Father Antonio Spadaro, many talking about the pictures the children have drawn. The questions (“these are tough...!”) are all over the map in terms of both theology and intimacy. An 8-year-old girl from Kenya wants to know how Jesus walked on water, a 10-year-old girl from the Philippines wants to know why parents argue, and Prajla, 6, from Albania wants to know if Francis enjoyed dancing in his youth. 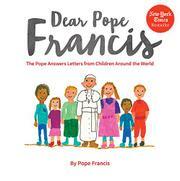 Answering in terms children can understand, Pope Francis addresses both their questions and the fears and hopes that lie beneath them. While these questions were likely chosen to present the pope’s vision and stances on many matters of Roman Catholic faith—dealing with the poor, the afterlife, prayer, evangelization, mercy (oddly, none address the environment)— that doesn’t mean that his answers to these youngest of his flock are anything other than important or relevant.